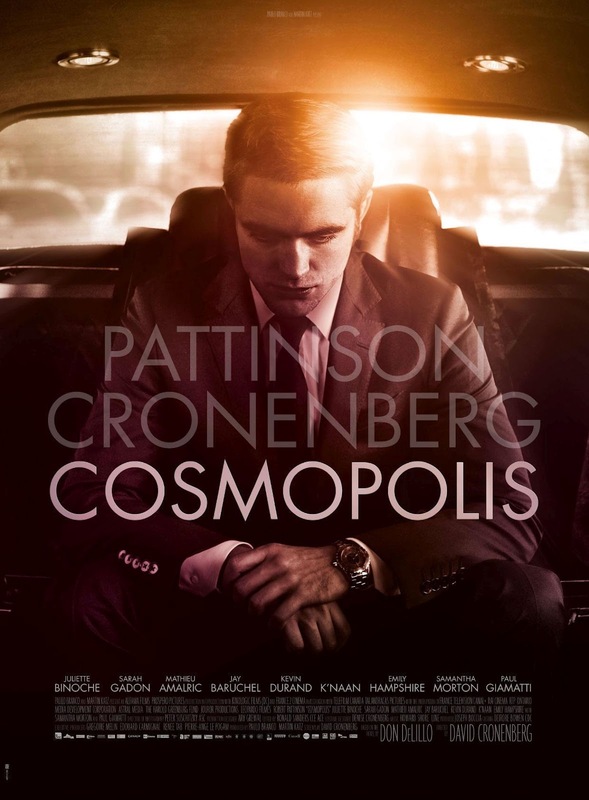 David Cronenberg's Cosmopolis is a difficult movie to like. I don't mean that it's not an interesting film or that there isn't a great deal of thematic and visual material to merit watching again. That's not really the issue at hand. However, at every opportunity, Cronenberg makes decisions to remove the audience's ability to engage with the characters, the narrative, and even the dialogue. It's as though we're meant to appreciate Cosmopolis as an exercise in alienating the audience. From the get go, something is amiss with Eric Packer (Robert Pattinson)'s day: the young hotshot entrepreneur / trader wants a haircut, but the city of New York seems to be conspiring against his wishes. His chief of security, Torval (Kevin Durand) warns him that getting anywhere is going to be impossible because the President is in town and traffic has slowed to a crawl, but Packer wants what he wants (although he's more fond of using the royal "we" when referring to his wishes). so they set out in his state-of-the-art limousine. Over the course of the day, he travel slowly enough to skip out and have three meals with his newlywed bride, Elise Shifrin (Sarah Gadon), a poet and heiress. Along the way, he also picks up various business advisers: Shiner (Jay Baruchel), Michael Chin (Philip Nozuka), Jane Melman (Emily Hampshire), and "philosophical consultant" Vija Kinsky (Samantha Morton), as well as entertain art dealer / mistress Didi Fancher (Juliette Binoche). Eric even manages to discuss business while undergoing his daily physical exam. The film is constructed of a series of vignettes as Eric waxes the philosophic about aging, trading, art, protests, wealth, and the "credible" threat to his life Torval has been monitoring all day. As his life begins to collapse - a result of bad business deals, dissolving relationships, and the death of his spiritual mentor, Brutha Fez (K'Naan) - Packer becomes more unpredictable, more unhinged, and his placid veneer cracks to reveal the nihilist underneath. It's not until nearly the end that any of this is evident, as Robert Pattinson's Eric Packer is a blank slate, concerned more with the intellectual than the physical - a theme that appears throughout Cronenberg's filmography, most notably in Crash, Dead Ringers, and more recently, A Dangerous Method. Accordingly, I hesitate to take the easy path of blaming the actor, mostly associated with the Twilight series, for the distant and unlikable protagonist of the film. A co-worker of mine described the film as an "existential meditation on the 1%" and that's not far off from what Cronenberg, adapting his screenplay from Don DeLillo's novel of the same name, seems to be attempting. It's hard to relate to anything that happens to Eric Packer at any point in the film, even if cultural anecdotes like a "Pastry Assassin" (Mathieu Amalric) who "pies" him is something we're familiar with in passing. To keep us off guard, Cronenberg and cinematographer Peter Suschitzky also place the camera uncomfortably close to the actors in Cosmopolis (think of a film like Repulsion as a good basis of comparison), giving the film a heightened sense of reality. We're physically close but emotionally and philosophically at a distance from the characters at all times. The most that happens in Cosmopolis occurs in the final scenes between Packer and Benno Levin (Paul Giamatti), and even that manages to detach us as the film heads towards its inevitable conclusion. On the other hand, I left Cosmopolis with a great appreciation of what Cronenberg, the cast, editor Ronald Sanders, and the score by Howard Shore (partially performed by the band Metric) accomplished. Cosmopolis is not an easy film to engage in, but it has a wealth of interesting concepts. I'm interested in seeing the film again for asymmetrical imagery, to examine the deliberately artificial first scene in the limo between Pattinson and Baruchel, and to draw the threads together in the seemingly episodic narrative. While I could appreciate A Dangerous Method, I felt that the idea of separating and internalizing the salacious sexual content removed any point of engagement in the film beyond a strictly intellectual level. Cosmopolis, while intellectually divorcing itself from the audience for most of the story, nevertheless manages to connect on a visceral level, even as it denies viewers basic expectations (including the final shot - no pun intended). On the other hand, it is often funny in a way absent from all but the most vicious of black comedies. I can't think of another film that generates the kind of uncomfortable laughter during a prostate exam that Cosmopolis does. The visceral reactions aren't always positive: during every showing of Cosmopolis' three week run, there was at least one walk out, if not more. One disgusted viewer explained that the film was "over the moment it started" and I can't say it's an unfair reaction. 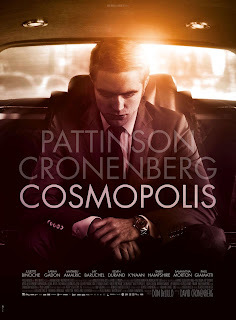 Cosmopolis is a demanding film that promises nothing and pays off only scant rewards the first time around. When I say it's not a film for everyone, that's not a value judgment on audiences. It's just a fact. You're going to have to do a lot of heavy lifting while watching Cosmopolis, and I can't guarantee that what you come out with is going to seem worth it. But if your ears perk up when you hear "Cronenberg" and "DeLillo" together, or how Robert Pattinson fits into the equation, it may just be worth the challenge.